Dharamshala: To commemorate the Vijay Diwas, the Sainik Welfare Department organised a function at Shaheed Samarak, Dharamshala. 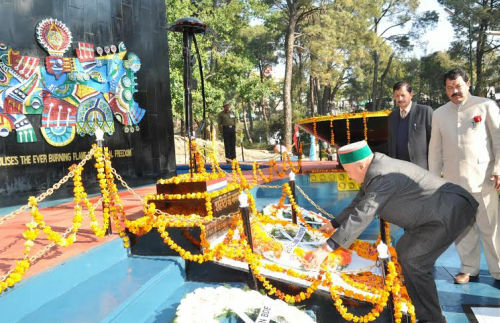 Chief Minister Virbhadra Singh, while addressing gathering, said that people of the country were indebted to the brave soldiers who made supreme sacrifices in the freedom struggle and then safeguarding the borders and maintaining the integrity of the country. He said that the valiant soldiers of Himachal Pradesh had always led from the front in making sacrifices for the cause of the motherland and they have brought laurels to the country and the State. The Chief Minister paid homage to all martyrs on behalf of the people of the State. He said that the State was indebted for the invaluable contributions of the soldiers which could not be compensated at any cost. Virbhadra Singh said that 195 brave soldiers of the State laid their lives during the historic war against Pakistan in 1971. The first Param veer Chakra of the country was warded to Major Somnath Sharma of Himachal Pradesh and out of total four Param Veer Chakras given for Kargil aggression; two were given to brave sons of Himachal Pradesh. He said that 14 Himachali soldiers had been conferred with Maha veer Chakra, 61 with Veer Chakra and till now 1140 soldiers of the State had sacrificed their lives for the cause of the country. He said that a War Museum would be established at Shaheed Smarak Dharamshala where brief description of all the martyrs since British period would be highlighted. An Expert Committee would be constituted for this purpose and the War Museum would be developed as per the recommendations of the Committee. He announced Rs. two crore for construction of War Museum and added that foundation stone would be laid soon. Chief Minister said that War Memorial would be further beautified for which all possible assistance would be provided to War Memorial Committee. He said that the busts of the Param Veer Chakras and Shaurya Chakras recipients would also be established here. He announced that all Congress MLA’s and Associate Members would contribute Rs. three lakh each from their MLA Fund for the development of the War Memorial. Virbhadra Singh said that the State Government was implementing various schemes for the welfare of the soldiers, ex-servicemen and their families. The Shaurya Chakra winners were being provided free travel facility in the State and the amount of Yudh Jagir had been enhanced from Rs. 2000 to Rs. 5,000 from 1st April, 2013. 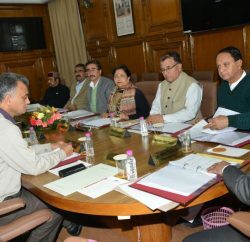 Similarly, the VAT had been reduced from four percent to two percent in the CSD Canteens and the process had been started to open CSD Depot and Model Cantonment at Una while the matter regarding Dogra Regiment Centre was under consideration. He said that the Social Security Pension for the ex-servicemen and their widows had also been enhanced from Rs. 400 to Rs. 500. The Chief Minister honoured and presented a cheque of Rs. 10 lakh to Shaurya Chakra recipient Capt. Dinesh Kumar who hails from Jubbal area of Shimla district. Capt. Dinesh showed exemplary act of bravery in fighting the intruders in Assam during year 2012. Speaking on the occasion, Social Justice and Empowerment Minister Dr. (Col.) Dhani Ram Shandil who also holds the portfolio of Sainik Welfare said that Himachal Pradesh had earned a special name as ‘Veer Bhoomi’ in the country and a large number of youth from the State were serving the Nation in the armed forces. 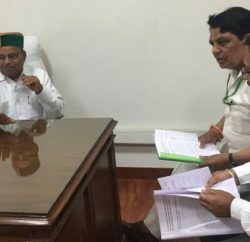 He said that Himachal Pradesh Government was committed for safeguarding the interests of the soldiers and ex-servicemen and their children were being provided reservation in various professional and educational institutes. Besides, they were also being provided scholarships and reservation in government jobs. Chief Minister also inaugurated 183rd branch of Kangra Central Cooperative Bank at Shri Chamunda Jee. G.S. Bali, Food and Civil Supplies Minister, Thakur Singh Bharmouri, Forest Minister, Sudhir Sharma, Urban Development Minister, Ravi Thakur, Vice Chairman, National Scheduled Tribes Commission, Neeraj Bharati and Inder Dutt Lakhanpal, Chief Parliamentary Secretaries, Maheshwar Singh, Ajay Mahajan, Rajender Rana and Pawan Kajal, Karnesh Jang, MLAs, Jagdish Sipahiya, Chairman, Kangra Central Cooperative Bank, Surender Kaku, Ex MLA, Major Gen. Vikram Singh, CMD, H.P. Ex-Servicemen Corporation, Col. B.S. Lagwal, Chairman, Ex-Servicemen League. Brig. Anup Kumar, Officiating Chief of Staff, Brig. Satinder Singh, Brigade Commander, Subhashish Panda, Secretary, Sainik Weflare, C. Palrasu, Deputy Commissioner, Ashish Singhmar, Director, Sainik Welfare and other senior officers were also present on the occasion.